For all her gifts as a master of the modern detective novel, Agatha Christie was never terribly comfortable with the insides of the human head. In Christie Land—that glorious old world realm of murder, righteous neighborhood busybodies, and fastidious little Belgians—the motives for killing are rarely complicated. If it’s not money, it’s revenge; if it’s not revenge, then the removal of an intractable romantic obstacle. There’s not a lot of room for complicated human psychology to squeeze through those cracks, something that’s frequently threatened to render adaptations of Christie’s trove of novels feeling a little bit sterile and dry to modern minds. That’s not a problem, though, with Amazon’s new Christie adaptation, the three-episode limited series Ordeal By Innocence; if anything, it’s a tad too willing to crawl inside its characters’ fractious, fucked-up heads. Adapted with bracing, occasionally disorienting looseness by director Sandra Goldbacher and writer Sarah Phelps (originally for the BBC, which aired it back in April), Ordeal By Innocence is Christie as something very much like black comedy, inviting us to peek in on a family of rich British miserables as their collective dark secrets rise up to slowly tear them all apart. Here’s the plot—one of Christie’s better hooks—in brief: It’s Christmas Eve, 1959, and wealthy philanthropist Rachel Argyll (Anna Chancellor) has just been murdered. Suspicion immediately falls onto her son Jack (Anthony Boyle), one of five adopted children that Rachel and her husband, Leo (Bill Nighy), have taken into their home and raised. Despite claiming innocence, Jack is quickly swept off to prison, where it doesn’t take very long for his impulsive, aggressive nature to earn him a fatal beating. The family is just vaguely beginning to recover from this double tragedy 18 months later, when, a shabbily dressed man (Luke Treadaway) arrives at their door with a beat-up suitcase, an uncomfortable, stammering manner, and what he thinks will be good news: He can provide an iron-clad alibi for Jack at the time of Rachel’s death. That’s understandably unsettling information for Leo and his surviving kids—bad boy Mickey (Christian Cooke), youthful rebel Hester (Ella Purnell), taciturn Tina (Crystal Clarke), and high-strung Mary (Eleanor Tomlinson)—since if Jack didn’t kill their mom, it means one of them probably did. Meanwhile, our introduction to the show’s cast—which also includes Alice Eve as Leo’s new fiancée/former secretary, Morven Christie as the house’s sole servant, and Downton Abbey’s Matthew Goode, having far too much fun as Mary’s bitterly awful and paraplegic husband, Philip—does double duty as an introduction to Ordeal By Innocence’s absolute, deliberate lack of subtlety or chill. This is the kind of show where we know Mickey is the “bad boy” because he’s introduced jamming lit cigarettes into his arm; where Tina’s complex relationship with her dead mother is underscored with flashbacks of the older woman screaming “Filth! Filth! Filth!”; where Philip’s first appearance has him leering, half-priapic, at his teenaged sister-in-law innocently kicking her legs up on a swing. Rather than adopting the conventions of the stolid period dramas that Christie’s novels so often pulled from, Goldbacher’s camera is a constantly invasive thing, getting uncomfortably close to her cast of misfits (most of whom have had their minor mental issues greatly expanded from the original novel for their TV debut). There is no shot too silly or too extreme; when Mary injects Philip with his daily dose of morphine, you half-expect a Requiem For A Dream-style shooting-up montage to accompany his newfound bliss. Christie has rarely been done as camp, but there’s something irresistible about the ways Goldbacher and Phelps have cranked up the novel’s restrained details into pure melodrama, transforming her characters into a collection of tortured caricatures. Only a few members of the cast seem to fully grasp the vibe that Goldbacher is supplying, though, most notably Treadaway, who manages to invest would-be do-gooder Arthur Calgary with so much existential, goggle-eyed uncertainty that it’s easy to doubt him even when the things he’s saying show up on screen as demonstrable truths. Ditto Goode, who seems to be reveling in the sheer ugliness of the character he’s being asked to inhabit; it’s not for nothing that the most mesmerizing scene in the series’ first episode is between the two of them, as Goode makes it clear precisely how vile and angry at the world he actually is. And flashbacks frequently serve up tantalizing glimpses of Anthony Boyle as the now-dead Jack, a gadfly of the highest order who seems to be the only person who realized how amusing his family’s absurd dramatics really were. 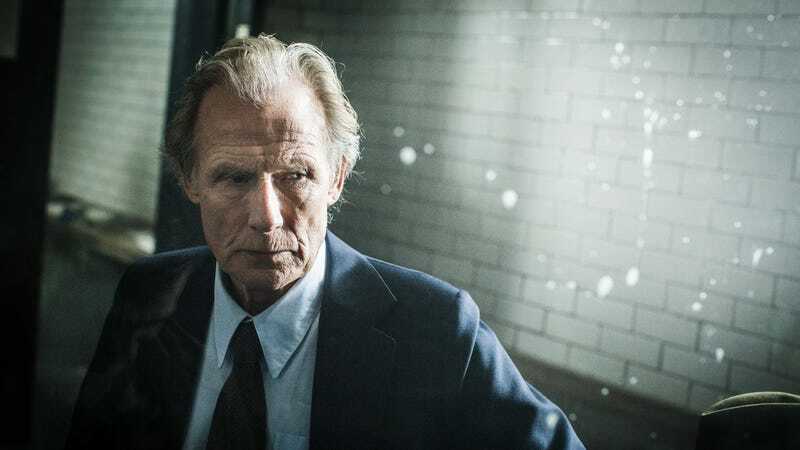 The rest of the performances range from serviceable to great; Nighy is so clearly doing the “Bill Nighy” role that it’s hard to even judge it as a performance; his Leo looms over the rest of his family like a sort of satisfied, aristocratic lizard. The other four Argyll kids all put in yeoman’s work, though only relative newcomer Crystal Clarke seems to understand exactly what kind of show she’s in, pitching her character Tina’s repressed silence as a pointed contrast to the high-pitched hysteria surrounding her. The most complicated work comes from Anna Chancellor as Rachel, who has to simultaneously make the family matriarch as loathsomely murder-able as possible, while still suggesting an inner life and struggle whose loss is worth mourning (and investigating). Despite her best efforts, Chancellor can never quite sell it, mostly thanks to the script; there’s just a bit too much Mommie Dearest to Rachel’s ugliest moments to see her as much more than an occasionally well-intentioned villain. The most radical thing about Phelps and Goldbacher’s adaptation, though, is a subtle heresy that only bleeds through over time: the absence of a true detective character, wandering around and piecing the mystery together. Even in Christie’s non-Poirot or Miss Marple books, there was always someone there to follow the clues and do the thinking; in the original Ordeal, it was Calgary, who sticks around to help the family riddle out the killer’s real identity. But Treadaway is so clearly unstable in the role, so wrong-footed and hard to trust, that it knocks that stable center away. (Ditto Goode’s Philip, whose airtight alibi should make him a reliable back-up, but who is, instead, so gleefully awful that it evokes feelings of despair.) When a “hero” finally does emerge, it’s almost accidental, and so late that the audience has spent the last few hours bouncing from character to character, desperately searching for someone, anyone, to trust. It’s almost a shame, then, when those actual mystery bits kick in, because it means that the madness and dread have to dial themselves back slightly to let all the necessary exposition seep though. Not that those aspects aren’t competently executed, mind you—especially as they slowly fill in the details of Rachel’s last day on earth, a marathon effort to give every single person in her life an astoundingly good reason to want to kill her off. It’s just that they can’t quite live up to the darkly comic, almost horrific tone the series’ earlier encounters have set. Meanwhile, strict whodunnit buffs will probably be reasonably well-satisfied, provided they can get on board with the jittery, introspective feel of the series in the first place. The drip of clues comes at an acceptably steady pace, and Goldbacher is kind enough to leave a few important details hiding out in plain sight for TV detectives to snag. 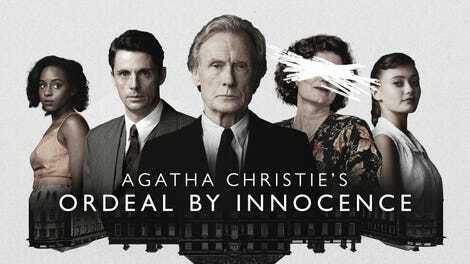 In the end, though, Ordeal By Innocence is going to be a turn-off for anybody drawn exclusively to the “Agatha Christie” in the series’ full title, a touch too sensual and just outright nasty for those raised on a steady diet of bland-but-satisfying Mystery entries and the fussy delights of David Suchet’s Poirot. It’ll hit a little closer for the Downton Abbey, “Let’s all ogle the fancy houses” crowd, but they’ll still have to stomach Matthew Goode’s gleeful dinnertime piss face, and wrestle with the series’ subversive, seething portrait of the lifestyles of the rich and comfy. (Really, there’s almost as much Poe, with his fascination for fancy human cesspools, as there is Dame Agatha on display.) Come to it in the spirit of excess in which it was created, though, and the series is a treasure chest of strange delights. It’s not subtle—and occasionally outright dumb—but it’s a gorgeous, beautifully acted bit of squalor, nevertheless.